Desperate times call for desperate measures, high risk commando and paratrooper mission were conceived and executed. Not all were successful but the skill and bravery of the troops involved is unbelievable. 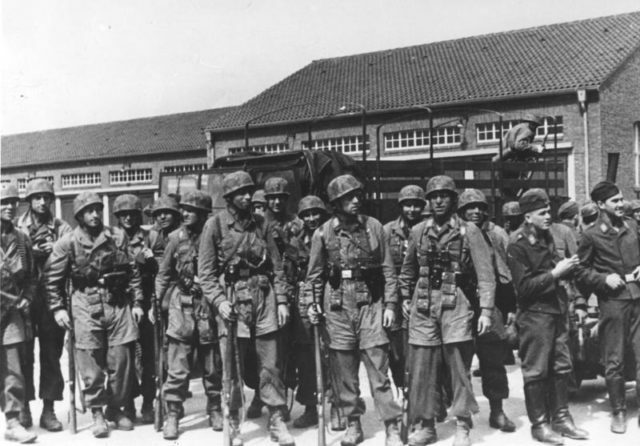 In this raid a German Fallschirmjager (paratroopers) assault force was given the task of the attack and capture of Fort Eben-Emael. This fortress was in Belgium and was in a position to best dominate bridges that crossed the Albert Canal. It was fortified with artillery, ready for any German forces that used the bridges to cross into Belgium. Part of the German force stormed the fortress and then worked at disabling the garrison and all of the artillery within. The rest of the German troops managed to capture three of the bridges that crossed the canal. Once the fortress was disabled, the paratroopers were then given orders to guard the bridges from any counter-attacks that may come from Belgian forces. They maintained this defensive position until further troops arrived from the 18th Army (German). This battle was an outstanding victory for the Germans; the paratroopers had landed atop the fort, using gliders and then used their artillery (flamethrowers and explosives) to disable the fortresses outer defenses. Once this was done the troops went inside the fort, killing some enemy defenders and trapping the rest down below in the depths of the fort. Whilst this was happening the remainder of the German force had landed in position next to the three bridges that crossed the canal. They destroyed a number of Belgian defenses and pillboxes and defeated the forces (Belgian) that were guarding these bridges. These Belgian troops were captured. The German troops suffered heavy losses in this operation but did manage to hold the bridges until the 18th Army arrived; and with their combined force they attacked the fort a second time and managed to force the rest of the garrison to surrender. The Germans then used two of the bridges to advance into Belgium whilst bypassing Belgian defenses, as part of their plan for invasion. Sadly the Kanne Bridge was destroyed. 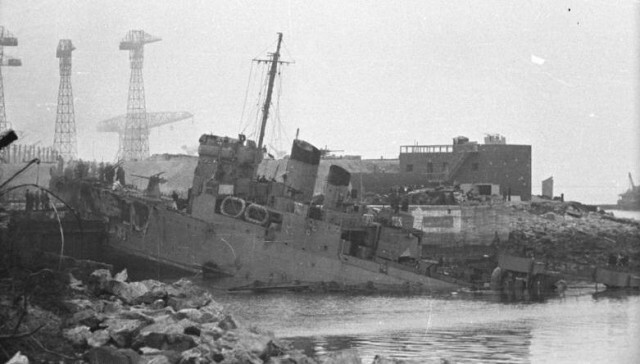 Operation Chariot, or the St Nazaire Raid, was a triumphant British attack from the water. This took place at the dry dock in St Nazaire, Normandy, which was very heavily defended. The combined forces of the Royal Navy and British Commandos undertook this operation on March 28th 1942. The reason St Nazaire was the mission target was due to the fact it had such a large dry dock. Losing this dock would mean any German warship requiring repairs would be forced to return to Germany and not make repairs at this closer dock. HMS Campbeltown (destroyer) led this operation, joined by eighteen smaller craft. They crossed over the English Channel to France and smashed into the dock gates. The Campbeltown had been packed full of delayed-action explosive devices that detonated later in the day. This put the dock out of use for up to five years. British commandos landed with the intent of destroying any machinery or structures they could find. German gunfire rained upon their craft near the dock, immobilizing some, sinking others and setting ablaze the rest. The British had no transport to escape to so were forced to attempt to escape over land. They eventually had to surrender to the Germans due to running out of ammunition for their weapons. Following this raid, out of the 622 British men involved, 169 were killed, 215 became POW’s and 228 returned home to Britain. German troops lost over 360, killed in action (most upon the explosion of HMS Campbeltown). Eighty-nine decorations, including 5 Victoria Crosses, were awarded to troops following this Operation. This battle / operation is known as ‘The Greatest Raid of All’ within the military. Operation Flipper, or the Rommel Raid was a raid carried out by the British Commando, mainly the Scottish No. 11 Commando) in World War 2. 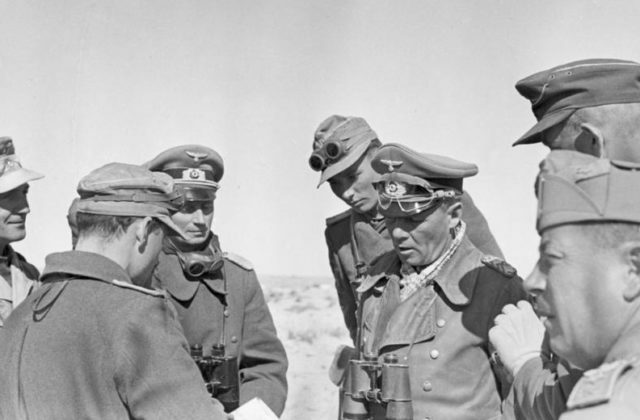 One of the objectives of this operation was to mount an attack upon Erwin Rommel’s headquarters; Rommel was the commander of Axis forces that were stationed in North Africa. The aim was to strike on November 17th-18th 1941, at night, before Operation Crusader began (another British offensive). Operation Flipper failed however, as Rommel had departed the house that was under target weeks previously. Of all the commandos involved in this operation only 2 were not captured or killed. On the day the raid occurred Rommel was not present in Africa, he had departed for Rome on November 1st (discovered by British Intelligence). Rommel was with his wife celebrating his 50th birthday in Rome and returned to the field on November 18th, the day following the raid. When Rommel learned of the raid he was indignant that the British believed that his headquarters were so far from the front line (250 miles) as he was always close to the action of the front. Operation Oak was an operation designed to rescue Mussolini, following his being jailed in Italy. The Nazi’s intercepted an Italian coded radio message that determined where Mussolini was being held – Campo Imperatore Hotel, an Italian ski resort high up in the Apennine Mountains. 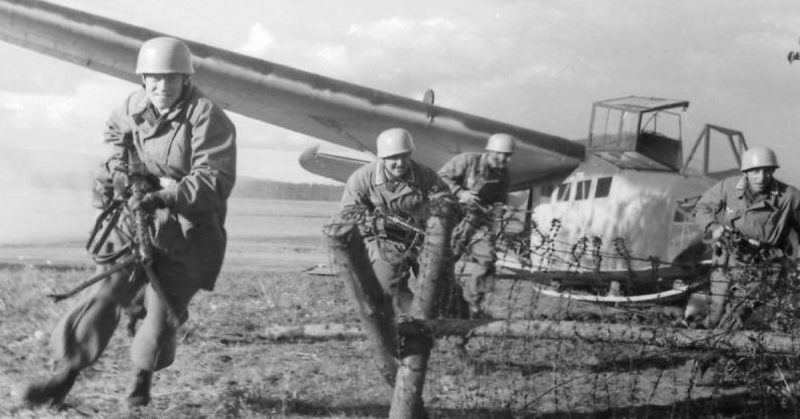 Skorzeny joined the German Paratroopers and they embarked on a glider mission that was classed as high-risk. 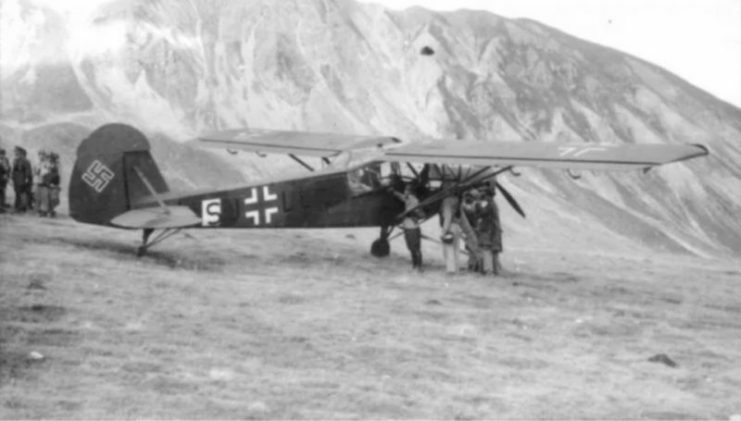 They managed to land their DFS 230 gliders on the mountain with only one crashing, which caused minor injuries. Skorzeny’s troops, along with the paratroopers proceeded to overwhelm the captors of Mussolini (Carabinieri guards – 200 of them) without having to fire a single weapon. They accomplished this feat as travelling with them was General Fernando Soleti of Polizia who told the Carabinieri guards to stand down or face execution for treason. Skorzeny took out the radio equipment, and operator, and greeted Mussolini with the words ‘Duce, the Fuehrer has sent me to set you free!’ Mussolini’s response was simply ‘I knew that my friend would not forsake me’. Mussolini was then flown to Rome, with Skorzeny. They travelled in a Luftwaffe Fieseler Storch; even though this was a craft for one person and the extra weight of a second passenger almost made the plane crash. This operation was a commando raid against shipping in the Bay of Biscay’s Bordeaux port, which was occupied by the Germans. The raid was put into action by the Royal Marines Boom Patrol Department, a small Royal Marines unit. Their plan involved taking six canoes, by submarine, to the Gironde estuary area and then paddle to Bordeaux by night. Once they arrived they planned to attack the ships that were docked using limpet mines and escape to Spain across land. Twelve men were chosen for this raid, all from Section 1 and including their CO Herbert ‘Blondie’ Hasler as well as a reserve: Marine Colley. This brought the team up to thirteen men. 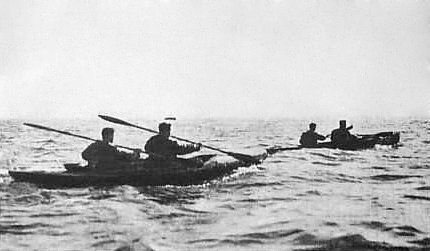 Only 2 of these men lived through the raid, Hasler and Bill Sparks (the 2nd person in his canoe). Six of the others were taken out by Germans and the other two died of hypothermia. Winston Churchill, the Prime Minister of Britain, considered this mission to have shortened the length of the war by a full six months. The leading commander of Combined Operations of the Royal Marines was honored by having his words carved into a monument (Purbeck stone) at Poole ‘Of the many brave and dashing raids carried out by the men of Combined Operations Command none was more courageous or imaginative than Operation Frankton’. Operation Gunnerside (named after the place that head of SOE Sir Charles Hambro and family used to go grouse shooting) was the name given to the British operation that helped a heavy water sabotage, led by Norwegian saboteurs to help stop the nuclear energy project that the Germans were running from receiving deuterium oxide (heavy water) which they needed to create nuclear weapons. British authorities knew of the Norwegian’s attempts to stop heavy water from arriving at the Germans base and decided to mount this operation alongside them. On the evening of February 16th, 1943, six commandos (Norwegian) were dropped in by parachute. They landed successfully and joined forces with the Norwegian team (the Swallow team). The two teams, now combined, began making preparations for their planned assault; to take place on February 27th-28th, 1943. Awaiting attack the Germans put additional guards, mines and floodlights around their plant. Security however had lessened over the winter period, though the lights and mines were still in place. The only entrance however, a 75 meter bridge that spanned the 200 meter ravine above the River Mane, was heavily guarded. The force elected to bypass the bridge, instead descending to the bottom of the ravine, crossing the icy waters and climbed up the steep bank on the far side. The levels of the river were low and, once upon the far bank, they followed a railway track that led them straight into the plant without any enemy encounters. The party then entered the main basement and came across the caretaker of the plant (Johansen) who was happy to cooperate. They then placed charges within the chambers and set a fuse to allow them time to escape. They deliberately left a Thompson submachine gun behind so that the Germans knew this was the work of the British. The charges detonated and destroyed the electrolysis chambers. This operation managed to destroy over 500kg of heavy water, along with equipment critical to the Germans operations. All members of the operation managed to escape to safety, although 3,000 German troops were sent to search for them. 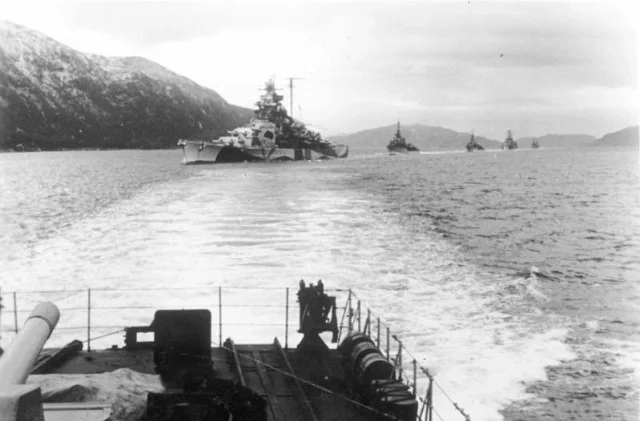 Operation Source was sets of attacks that were designed to neutralize heavy German Warships (Scharnhorst, Lutzow and Tirpitz) that were based in N. Norway. They used X-class submarines for these attacks. September 1943 was when these attacks occurred and they succeeded in putting Tirpitz out of all action for a minimum of 6 months. This attack was directed, and indeed organized, from HMS Varbel which was located at Port Bannatyne, Isle of Bute. Varbel was the headquarters for 12th Submarine Flotilla, having been a luxury hotel with 88 bedrooms previously. This hotel was requisitioned by the Admiralty so that it could be utilized as the headquarters for the Flotilla.